My colleague Molificent and I came upon the topic of cakes the other day (you would have thought this topic came up a lot given I work in a cafe but apparently not so much) and I began wondering, as only the mind of someone staring at cake all day can, why we have red velvet cake. Why not other colours? Admittedly a green cake might put us off our food, but why not a blue cake. Unnatural yes, but then what is natural about the vivid red hue of a true red velvet cake? To be terribly British of me, it is the epitome of the difference in cuisine between Americans and English. The English like basic, traditional stodge and couldn’t care less if it was plated up. The Americans like exciting colourful reinterpretations of the classics like cake pops and whoopie pies (stereotyping I know but this is a food blog post not a political argument). So I scoured the internet for Red Velvet Cake recipes. I discovered that unfortunately the cocoa was essential for more than just flavour. The chemical reaction between the cocoa, bicarbonate of soda and red food colouring was what increased the intenseness of the red colouring. How was I meant to recreate this given that there is no such thing yet as a white chocolate cocoa powder. Molificent suggested investing in a dehydrator, but firstly I can’t afford another slightly unnecessary kitchen implement, secondly it wouldn’t have the same effect as cocoa as the whole point of cocoa is the lack of dairy or sugar and finally my housemates wouldn’t let me buy anything more that might clog up our kitchen surfaces. So instead I upped the bicarbonate of soda to increase the acid levels to supplement the acid in the cocoa and added white chocolate pieces to add a white chocolate flavour in lieu of the cocoa flavour. 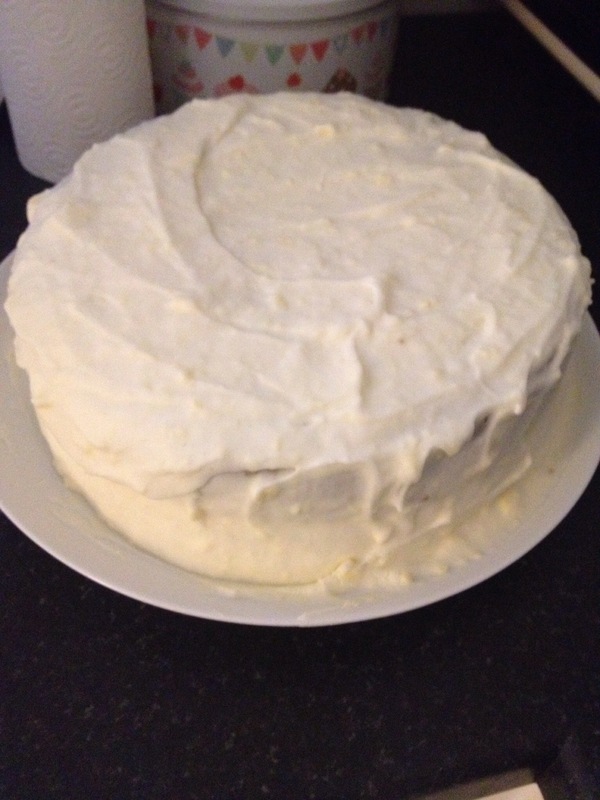 The result was the moistness of a red velvet cake with the overwhelming sweetness of a white chocolate cake (NB this recipe is for the sugar addicted only). 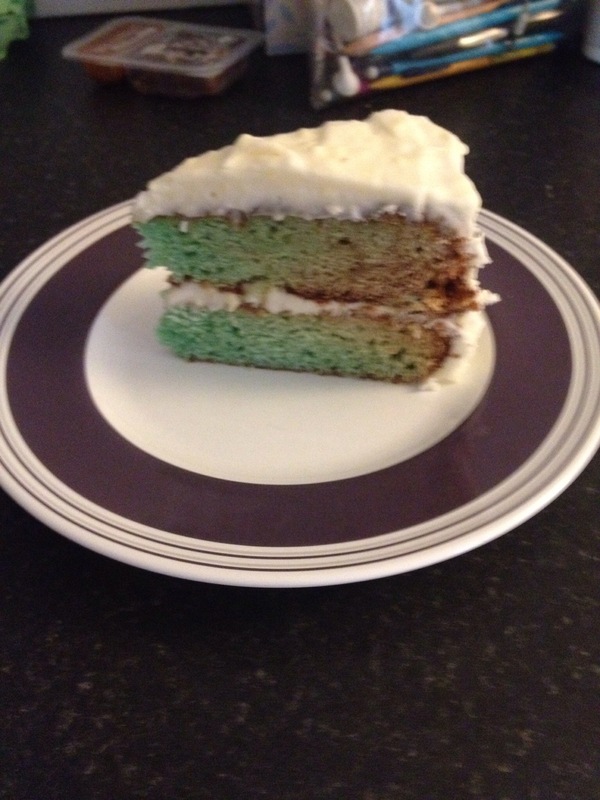 My only regret is that I didn’t add enough blue food colouring so the resulting cooer of the cake was too green, for future reference, a whole bottle of blue gel food colouring will be needed. Cream the butter and sugar together, add the eggs and vanilla extract, beat well. Add the flour, food colouring, salt, chopped chocolate and buttermilk, mix. 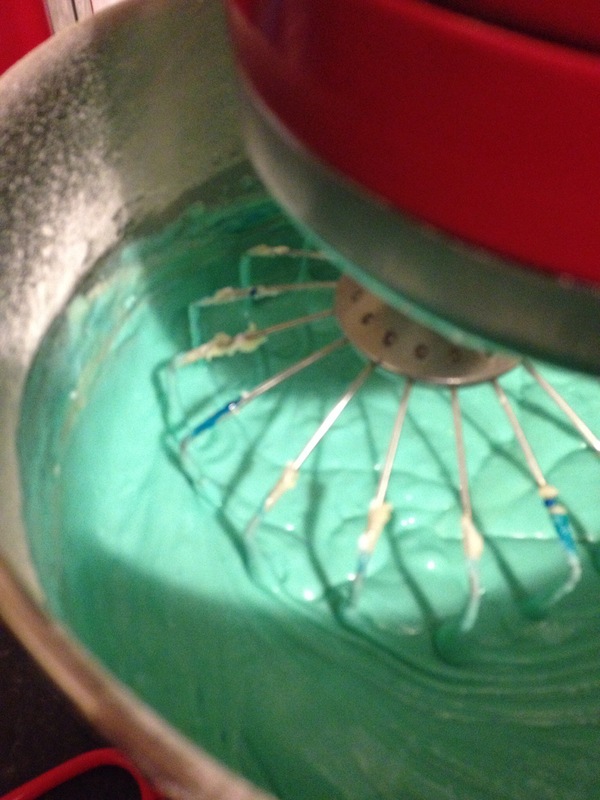 In a cup mix the vinegar and soda and immediately add to the cake mix. Pour immediately into two prepared sandwich tins. Bake in the oven at 180oC for 30-40mins until a skewer comes out clean. Leave to cool COMPLETELY. Meanwhile mix the WELL SOFTENED butter with lemon juice and icing sugar together. When beaten, add the cream cheese. Spread onto the cooled cake as a a filling and topping. Serve. 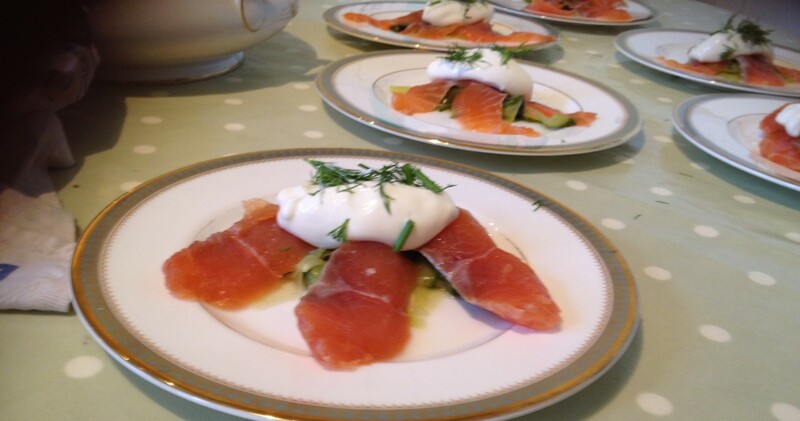 This entry was posted in Patisserie/Baking, Recipes and tagged American, Cake, red velvet cake, White Chocolate. Bookmark the permalink.